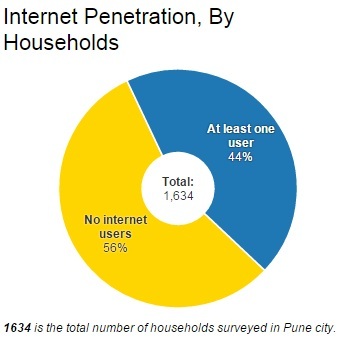 A new study buttresses the claim that India’s Internet use is low. 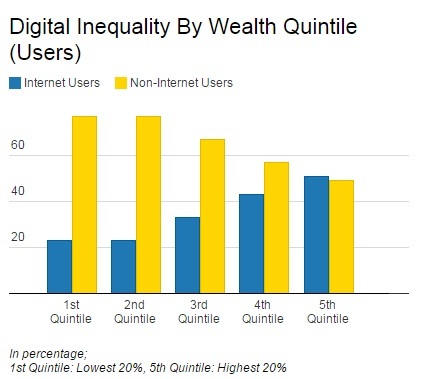 Recent indications that India’s Internet use is low and not reflected in the numbers of mobile-phone connections and growth are buttressed by a new study that points to digital inequality in urban areas. * 82% of people surveyed in low-income neighbourhoods don’t use Internet. * 56% of households have no Internet users at all. * 41% of non-users have never heard of the Internet. * 43% of people between 16-25 years of age do not use Internet. 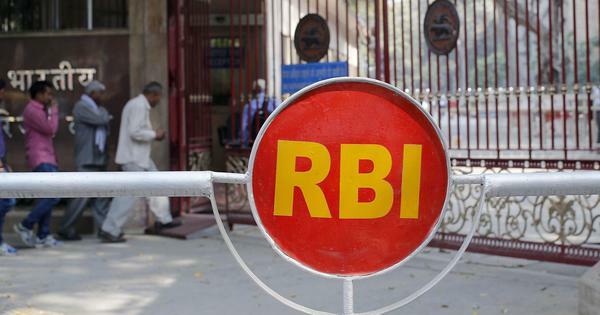 The results are likely to be similar in more prosperous cities, such as Bengaluru and Delhi, worse in poorer cities. Although Internet users in India are increasing rapidly, and the country is Asia-Pacific’s fastest-growing smartphone market, only 22% of the adult population in India uses the Internet, compared to the global median of 67%, according to this survey by Pew Research Center, a US research institute. 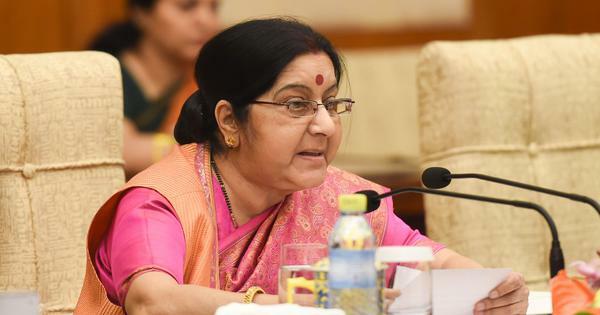 India lags most major economies and performs worse than Nigeria, Kenya, Ghana and Indonesia, among other countries, the data reveal. Yet, in absolute numbers, India likely overtook the US and became the country with the world’s second-largest Internet market, with 402 million active Internet users in December 2015. These figures clearly hide great variations, the Pune study revealed. 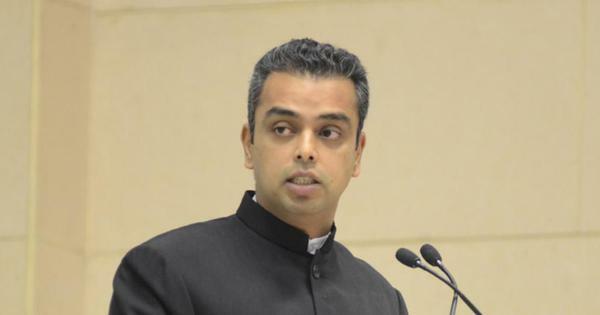 The study, “Towards Digital Inclusion: Barriers to Internet access for economically and socially excluded communities” conducted in low-income and socially excluded neighbourhoods by the Centre for Communication and Development Studies, a Pune non-profit, provides rare empirical evidence of digital inequality. Pune has grown rapidly over the last two decades to become the eighth-largest urban agglomeration in India. In 2015, Pune ranked second only to Bengaluru in software exports from India. The city has as many as 3.6 million Internet users (a 34% year-on-year growth), according to “Internet in India 2014”, a report from Internet and Mobile Association of India. 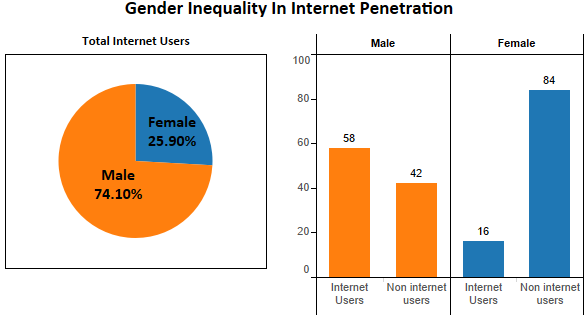 Only 26% of all Internet users were women, and 84% of all surveyed women do not use Internet, compared to 42% of all men. It is primarily men in the household who acquire smartphones, while women are handed down older, basic phones without data access, or feature phones that allow only limited Internet applications. 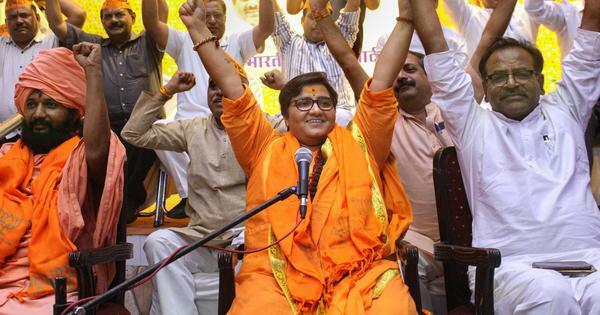 Parents believe that girls don’t need mobiles, since they stay at home more than boys. There is also a widespread feeling that mobiles made available to women will lead to unwanted romantic liaisons and “exploitation”. Boosting Internet access for women has the potential to boost their participation in the labour-force participation, according to this Mckinsey study. 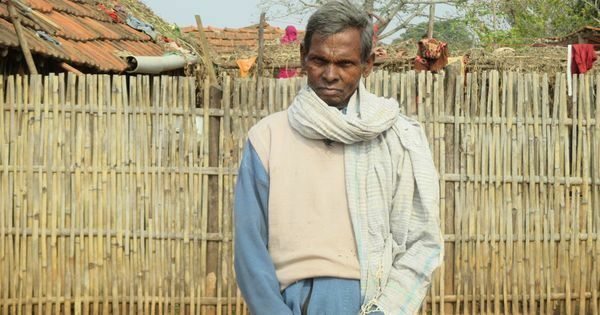 Recently, several villages in Gujarat banned mobile phones for girls and single women, a confirmation of widespread patriarchal norms hindering gender equality. 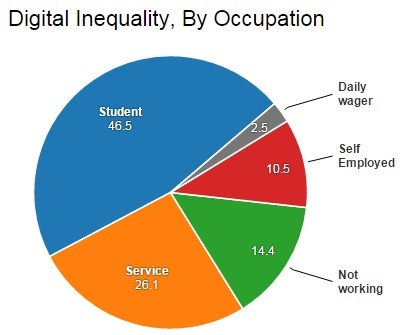 As many as 56% of households with at least one member with a class-10 education or enrolled currently were “connected”, meaning at least one Internet user, as compared to 14% of households without anyone with similar education. As the chart below shows, the number of non-Internet users decreases with increasing education levels. Of those who never attended school/had any primary education, only 3% access the Internet, compared to 83% of those who are graduates and above. 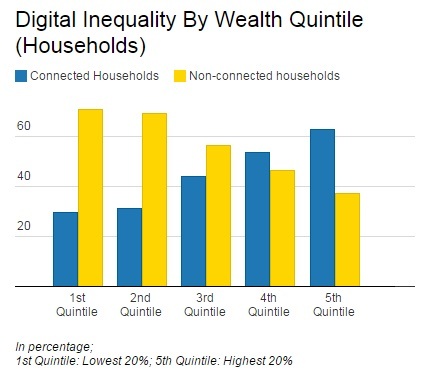 Only 29.4% of households in the first wealth quintile (poorest) were connected, compared to 62.8% of households in the fifth quintile (richest). 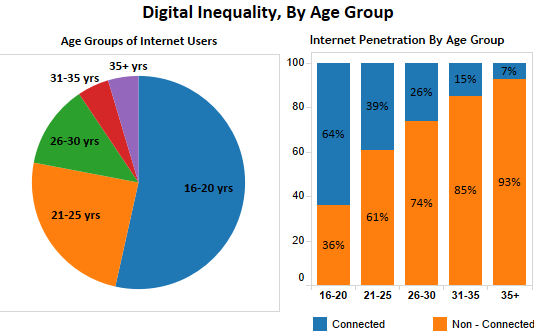 53.5% of all Internet users were between 16 and 20 years of age. The percentage decreased with age, as the chart below shows. 46.5% of Internet users were students, while 26.2% were in the service sector, establishing a link between occupation and access. 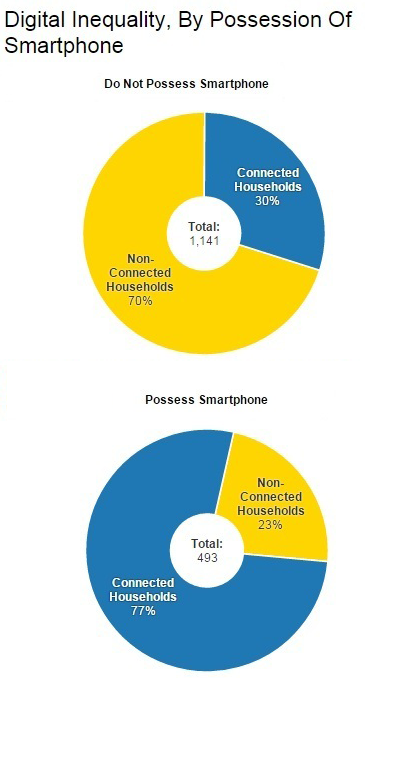 As many as 77% of households with a smartphone accessed the Internet, compared to 30% in households without a smartphone. “Smartphone users are leading India’s Internet growth,” said this recent report from Google India. A direct correlation between access to Internet and smartphone ownership was noticeable in the Pew survey. 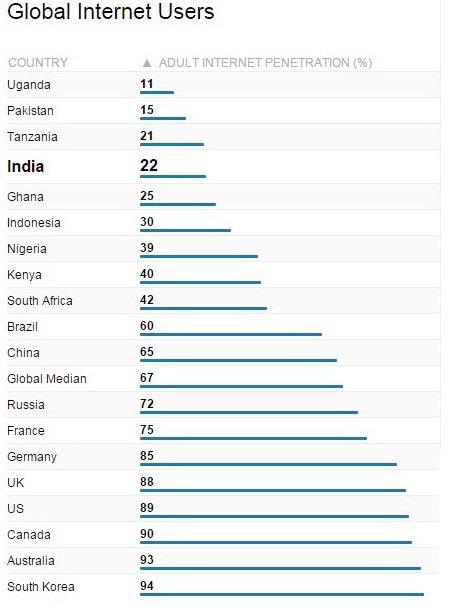 Only 17% of Indian adults own a smartphone, according to the survey by Pew Research. Only 7% of adults in low-income families own a smartphone; the figure for wealthier families is 22%. As many as 21% of non users believe that the Internet is not useful for women; the number was 32% for Internet users. As many as 35% of male users and 24% of female users felt the Internet had increased their confidence and enhanced their personality. The CCDS field research was spread across six low-income settlements, 1,634 households and 5,999 citizens in Ambedkar Nagar, Janata Vasahat, Laxmi Nagar and Patil Estate in Pune Municipal Corporation areas and Anand Nagar, Mahatma Phule Nagar in the Pimpri Chinchwad Municipal Corporation.